Monday – Friday 5:30 pm – 11:00 pm. Call the restaurant at 504-553-2277 to make a reservation or book online. 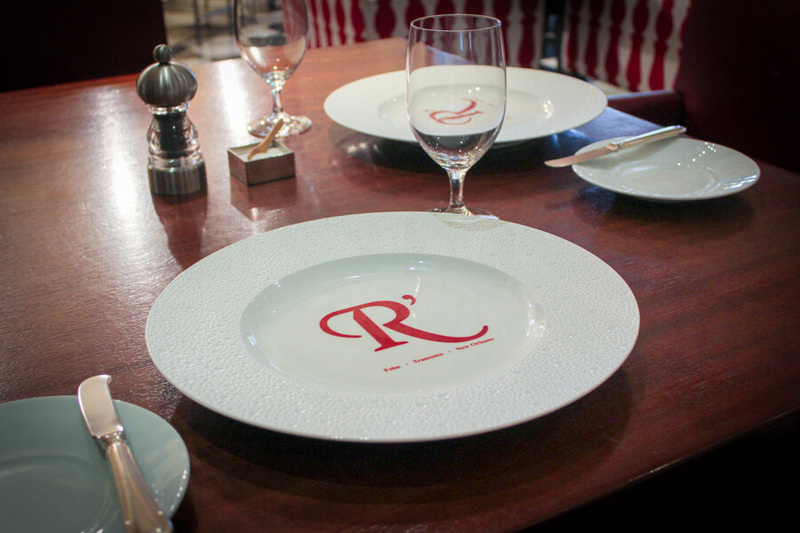 Restaurant R’evolution’s menu reflects a melding of the chefs’ distinct culinary styles. Steeped in the diverse historic and cultural influences of Louisiana, the menu features not only the chefs’ interpretations of New Orleans classics such as gumbo, po-boys and beignets, but also new creations highlighting ingredients from what Chef Folse refers to as “the swamp floor pantry.” Classical New Orleans ingredients such as Gulf shrimp and oysters, Andouille sausage and catfish appear alongside alligator, frog, crawfish, kumquats, sassafras and persimmons and other indigenous ingredients that have defined Louisiana cooking for centuries. Soups include “Death by Gumbo,” quail gumbo served with a whole, semi-boneless quail stuffed with oysters, Andouille sausage and rice. Appetizers showcase selections such as Burrata cheese and choupique caviar with black olive oil, as well as roasted sea scallop with truffled cauliflower purée and beef cheek debris. Signature items feature playful and unique presentations such as “A Tale of Three Fishes,” which offers diners three seafood stews from three of the seven nations that settled Louisiana, including French bouillabaisse, Spanish zarzuela and Tuscan cacciucco served in three separate courses. The “Triptych of Pork” presents grilled belly, smoked tail and crispy ear, for a head-to-tail tribute to the Louisiana boucherie. Louisiana’s renowned seafood is prominently showcased in dishes such as grilled striped bass with lemon verbena broth, Swiss chard, caramel-poached turnips, fried root vegetables and turnip lemon powder. A flounder napoleon, stuffed with Louisiana crawfish and shrimp mousse, is served with artichoke and Gulf oyster stew and a crisp crawfish ball. Wild game also appears on the menu, reflecting the important role that hunting and outdoorsmanship play in Louisiana’s “Sportsman’s Paradise.” A large selection of premium steaks and chops is offered with a wide array of sauces, crusts and toppers, including tomahawk rib eye for two with blue cheese crust; Wagyu sirloin strip served three ways and bone-in filet with foie gras butter. Desserts showcase classical New Orleans sweets done in a new and contemporary way. “Coffee and Beignets” presents chicory mocha pots de crème with coffee-infused beignets and black fig jam. The chefs’ spin on a “Root Beer Float” layers locally made Abita root beer and vanilla semifreddo in a glass, topped with vanilla ginger foam, and served with a gingersnap tuile straw. Restaurant R’evolution is also known for its lively Sunday jazz brunch. In fact, acclaimed food, travel and lifestyle guide Gayot named Restaurant R’evolution among its 2015 Top Brunch Restaurants. Treated to live jazz from The Don Vappie Creole Trio, guests choose from the restaurant’s own take on mouth-watering local classics like Death by Gumbo, Duck Confit and Eggs, Eggs a la Cremé or the decadent Short Rib Grillades and Gravy, plus so much more. Several of the dishes were designed specifically for brunch by the restaurant’s award-winning culinary team. And, to take the guesswork out of ordering while keeping the experience affordable, there’s also a wonderfully curated pre fixe menu that comes in at around $75. Restaurant R’evolution also features extensive charcuterie and cheese programs, a large wine list and seasonal, market-fresh mixology. Service highlights tableside components for many dishes, promoting engagement with diners about the history of the dishes they are enjoying. Restaurant R’evolution Wine Director Steven Russett maintains a world-class selection of 10,000 bottles of wine from around the world, with a special emphasis on the seven nations that originally settled Louisiana and make up the backbone of Creole cuisine. Restaurant R’evolution’s comprehensive wine-by-the-glass program highlights white and red Burgundy, Bordeaux whites and California reds. As France, Germany, Italy and Spain are the foundations of Creole cuisine, the wine list focuses heavily on these countries, including classics such as Burgundy and Rhone varietals. Vintage wines, such as 1865 Madeira and 1982 Bordeaux, lend extra prestige to the wine program. In addition, an impressive selection of options representative of emerging wine-producing regions, such as Lebanon, Germany, Slovenia, Greece and South Africa is featured. Bar R’evolution offers chef-driven, seasonal cocktails inspired by modern takes on “gilded age” libations from the pre-Prohibition era. Reinterpretations of classic drinks such as the Presse, the Cobbler and the Absinthe Cocktail incorporate small-batch spirits, house-made Creole bitters, and chef-crafted ratafias (the French-influenced fruit cordials that have been produced in Louisiana kitchens for generations). Bar R’evolution also features an array of seasonally rotating craft beers from local breweries including Abita Brewing Company, Heiner Brau Microbrewery and NOLA Brewing. Restaurant R’evolution’s exciting, historically inspired design is the work of The Johnson Studio in Atlanta, led by Bill Johnson, AIA, who is lauded for his vision and personalized designs. Diners enjoy Chefs Folse and Tramonto’s cuisine in a setting that melds the antique architectural details of the grand homes and properties in the historic French Quarter with contemporary accents. Custom Creole pocket doors open to reveal seven unique dining spaces, each depicting a different room within a Creole mansion. The design of the Market Room, with its gleaming exposition kitchen, is inspired by Solari’s Delicatessen, which was an institution in the French Quarter for nearly 100 years. The formal Storyville Parlor will showcases a magnificent 1830s chandelier and hand-painted murals depicting scenes of Louisiana’s rich culinary and cultural past, by mural artist Grahame Menage. Even Bar R’evolution nods to the fundamental French Quarter carriageway, featuring custom gas lanterns and cypress wood ceiling beams. Five dining rooms within the restaurant can be privatized to accommodate groups from 6 to 40. With seating for 10, the Wine Room is the ultimate retreat for vinophiles, set within the restaurant’s custom-built wine cellar, with an up-close view of the spectacular selections and access to drop-down flat-screen televisions for entertainment or presentations. The Wine Room also boasts its own private entrance off of Bienville St., allowing those who have booked it to access it directly. For the ultimate experience, guests can reserve the Chef’s Dining Room, an intimate room with seating for six, overlooking the restaurant’s main kitchen line. In this private room, culinary enthusiasts have an exclusive bird’s-eye view of the cuisine in action. 11 OVER-THE-TOP HOTEL BRUNCHES AROUND THE U.S.
2015 TOP BRUNCH RESTAURANTS IN THE U.S.
WHAT IS A SOMMELIER? MOLLY WISMEIER IS ONE OF THE BEST.